Life finds a way — and if it doesn't, there's always a strategy guide. 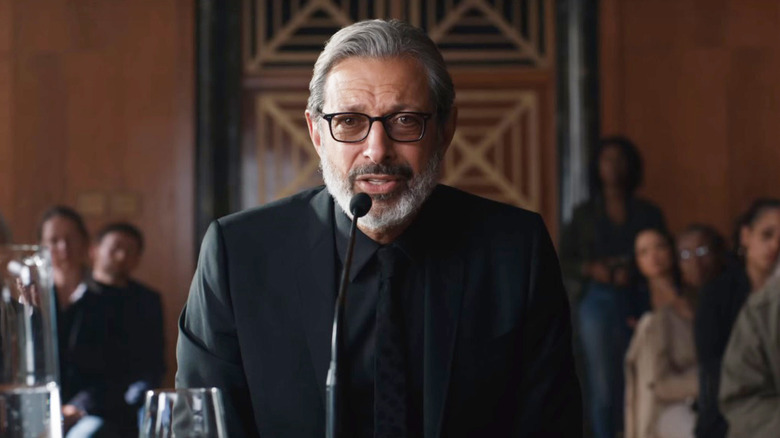 Set to reprise his role as Dr. Ian Malcolm in the upcoming Jurassic World: Fallen Kingdom this summer, Jeff Goldblum will also help to bring the character over to an interactive format, voicing the sarcastic mathematician in the video game Jurassic Park Evolution. Unlike other Jurassic Park video games from over the years that took a side-scrolling action or first-person shooter approach to the material, the upcoming game is a theme park simulator with a prehistoric twist. According to a report by Entertainment Weekly, Goldblum will be a major presence in the game, helping players to puzzle out their approaches to park management in a manner similar to the panel of advisors that populate various SimCity games. Developed by Frontier Developments, the creators of the RollerCoaster Tycoon theme park simulator series, Jurassic World Evolution will put players in control of managing the infamous dinosaur attraction, allowing them to build their own Jurassic World for the benefit — or terror — of mankind. Tasked with operating the research and park facilities on Isla Nublar and the surrounding islands of the Muertes Archipelago, players of Jurassic World Evolution will need to build facilities, manage resources, respond to crises, and otherwise do their absolute best to keep all park guests and staff alive. It's probably not so easy once you're in the driver's seat, which is what's going to make Dr. Malcolm's calming presence all the more helpful. He's been through all this before, after all. "I'm gonna be with you the whole game as Dr. Ian Malcolm — that's the character that I play in those Jurassic Park movies," Goldblum said during his casting announcement. "I highly recommend it. It gets ten Goldblums out of a possible ten Goldblums. That's my highest rating." Goldblum played Ian Malcolm in the original Jurassic Park as well as its sequel, The Lost World. This wouldn't be the first time Goldblum played Malcolm in a video game — previously, he lent his voice to the PC real-time strategy game Chaos Island: The Lost World, which was released by Dreamworks Interactive in 1997. Other games from Frontier Developments aside from the RollerCoaster Tycoon series include the similar theme park simulation titles Thrillville, Screamride, and Planet Coaster, meaning the people behind this project have notched a lot of experience in making sim games like this work. The developer is also responsible for the open-ended outer space exploration and combat simulator Elite: Dangerous. Jurassic World Evolution will be released on PC, PlayStation 4, and Xbox One this summer. Watch the trailer for the game down below.